Calling the powers unfathomable nature of these beasts, the people of ancient Ireland wore the Celtic animal symbolism to try to understand the incomprehensible contrast to the natural cycles of Earth. Chamando os poderes insondáveis destas bestas naturais, o povo da Irlanda antiga usava o simbolismo animal Celta para tentar compreender o incompreensível contrário dos ciclos naturais da Terra. The Celts looked to the beasts of the earth, sky, and sea to find teachers, friends, and healers. Os celtas olharam para os animais da terra, céu e mar a fim de encontrarem professores, amigos e curadores. Along with this fascination and almost worship of animal symbols, the Celts revered Nature itself, be it in the form of plants, animals, or elements. Junto com este fascínio e quase adoração dos símbolos dos animais, os celtas reverenciavam a própria Natureza, seja na forma de plantas, animais ou elementos. They believed the animals were there to teach them how to live in harmony with Nature itself. Eles acreditavam que os animais estavam lá para ensiná-los a viver em harmonia com a natureza em si. Through animal symbols, the Celts sought to commune with both the seen and the Unseen. Através de símbolos animais, os celtas procuravam comunicar-se com ambas as formas: visível e o invisível. We can see this tie to Nature not only in early Celtic crafts, but also in later Irish art. Podemos ver este empate com a Natureza, na confecção dos artesanatos celtas não só no início, mas também na arte irlandesa posterior. In the greatest example of medieval illuminated manuscripts, the Book of Kells, the four Evangelists were frequently depicted as Celtic animal symbols: Matthew the man, Mark the lion, Luke the calf, and John as the eagle. No maior exemplo de iluminura medieval, o Livro de Kells, os quatro Evangelistas eram freqüentemente descritos como símbolos animais Celtas: Mateus, o homem, Marcos, o leão, Lucas o bezerro, e João, a águia. Elite Irish families used animal symbolism on their Coats of Arms. As famílias da elite irlandesa têm utilizado o simbolismo dos animais em seus brasões. Pubs often took their names from animals renowned for their strength. Os Pubs muitas vezes têm seus nomes por causa de animais conhecidos por sua força. Today, Irish coins are minted with animal symbols such as peacocks, salmon, and stags on their faces. Hoje, as moedas irlandesas são cunhadas com símbolos de animais como pavões, salmão e veados em seus rostos. Groundhog Day first arose from Imbolc - the ancient Celtic celebration of the world awakening from its winter slumber. Groundhog Day surgiu pela primeira vez em Imbolc - a celebração antiga do mundo celta, despertando de seu sono de inverno. Celtic animal symbols took a myriad of forms and meaning. Símbolos celtas de animais tiveram uma miríade de formas e significados. The graceful curves of the crane. As curvas graciosas do guindaste (cegonha). The stalwart might of the bull. O fiel poder do touro. The slow, coiled menace of the snake. A ameaça, lenta e espiral da serpente. 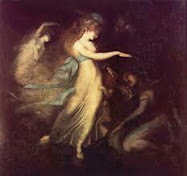 The early Celts believed the animals arose from the fantastic Otherworld whence come the elves and fairies. Os antigos celtas acreditavam que os primeiros animais surgiram a partir do outro mundo fantástico de onde vêm os elfos e fadas. With their feats of flying, swimming, phenomenal speed, keen sight and smell, and great strength, these messengers of the gods seemed beyond the power of man. Com seus feitos de voar, a natação, a velocidade fenomenal, visão aguçada e faro, e de grande força, esses mensageiros dos deuses pareciam estar além do poder do homem. 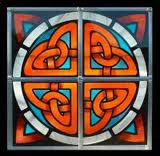 Celtic animal symbolism comes from a rich lore, story, music and drawing upon a myth as old as that of Greece or Rome. Indeed, the Celtic symbols animals are not insignificant slice of distant history, but a live link that stretches from the ancient Celts to the Irish people today. When we admire the Celtic symbols animals, we must remember that they are exactly what they say they are symbols. They are inserted merely for decoration, because they are there to represent aspects of each animal that the Celts honored. Understanding the Celtic animal symbolism is necessary to understand the art that the artist was trying to convey in all his work. In seeking to understand animal symbols Celts, we understand the relationship Celtic for Nature and the Divine. Between the old and all generations to come. O Simbolismo animal Celta surge de uma abundante lore, conto, música e desenhos em cima de uma mitologia tão antiga quanto a da Grécia ou Roma. Na verdade, os símbolos celtas animais não são insignificantes fatias da história distante, mas uma ligação viva que se estende desde os antigos celtas ao povo irlandês de hoje. Quando admiramos os símbolos celtas animais, é preciso lembrar de que eles são exatamente o que eles dizem que são: símbolos. Eles não estão inseridos para mero adorno, pois eles estão lá para representar os aspectos de cada animal que os celtas honravam. Para entender o simbolismo animal Celta é necessário compreender a arte que o artista estava tentando transmitir em toda a sua obra. Ao procurar compreender símbolos animais Celtas, procuramos entender a relação Celta para a Natureza e ao Divino. Entre os antigos e todas as gerações que virão. The snake was a complex Celtic animal symbol calling forth many ideas to the Celts. A serpente era um símbolo animal complexo Celtic chamando adiante muitas idéias para os celtas. Representing the process of creation, rebirth, fertility, and healing. Serpents also represented the connection between the rivers and seas as well as the Heavens and Earth. Representando o processo de criação, renascimento, fertilidade e cicatrização. As Serpentes representam também a ligação entre os rios e mares, bem como os Céus e a Terra. The snake both protected the entrance to the Otherworld and acted as the gods' companion. A cobra tanto protegia a entrada para o Outro Mundo e agia como companheiro dos deuses. Ouroboros, the Earth Serpent represented the coiled energy within the Earth and, with her tail in her mouth, infinity. Ouroboros, a serpente representa a Terra a energia em espiral no interior da Terra e, com sua cauda em sua boca, o infinito. To the annual shedding of its skin, the snake was the Celtic animal symbolizing the cyclical nature of life. Graças à queda anual de sua pele, a serpente era o animal Celta simbolizando a natureza cíclica da vida. 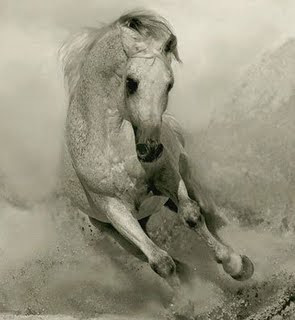 Horses are the most common animal symbols used by Celtic noblemen in battle. Os cavalos são os símbolos de animal mais comuns usados por nobres Celtic na batalha. These companions of the gods were known for their beauty, speed, vitality, and fertility. Esses companheiros dos deuses eram conhecidos por sua beleza, velocidade, vitalidade e fertilidade. The man who could take the reins of this representative of the goddesses Epona and Macha was a man who held power in his hands. O homem que podia tomar as rédeas deste representante das deusas Epona e Macha era um homem que detinha o poder em suas mãos. Horses were linked to the night, mystery, and magic. Os cavalos estavam ligados à noite, mistério e magia. Indeed, the term nightmare is taken from the word "mare", meaning female horse. Na verdade, o termo pesadelo é retirado da palavra "mare", que significa cavalo feminino. The Celts believed that nightmares were brought to the dreamer by a visiting horse from either Epona or Mare. Os celtas acreditavam que os pesadelos foram trazidos para o sonhador por um cavalo qualquer visitando Epona ou Mare. Horses were frequently sacrificed, yet highly adored by the Celts for their intimate relationship with the land. Os cavalos eram sacrificados com freqüência, mas muito adorados pelos Celtas pela sua íntima relação com a terra. Some of the most enduring examples of Celtic art are the huge carvings of horses found in cliff sides around Europe. Alguns dos exemplos mais marcantes da arte celta são as enormes esculturas de cavalos encontrados em penhascos ao redor da Europa. 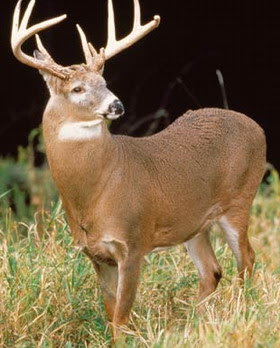 The deer was the oldest creature in existence according to the Celts . O cervo era a mais antiga criatura da existência de acordo com os celtas. The stag was particularly associated with Cernnunos, the horned god of nature and hunting. O veado era particularmente associado com CERNNUNOS, o Deus Chifrudo da natureza e da caça. The doe was the totem of most woodland goddesses, such as Saba and Flidais. A corça era o totem da maioria das deusas da floresta, como Saba e Flidais. This Celtic animal symbol was used to represent fertility, abundance, and renewal . Este símbolo animal Celta foi usado para representar a fertilidade, abundância e renovação. The antlers were often associated with trees and the sowing and harvesting of grain. Os chifres eram frequentemente associados com as árvores, o plantio e a colheita de grãos. In Celtic poetry, sagas, and lore, white stags arose from the Otherworld and often appeared before a profound change in the lives of the characters. 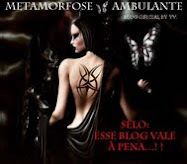 Na poesia celta, sagas, e lore, o veado branco surgiu do outro mundo e apareceu muitas vezes antes de uma mudança profunda na vida dos personagens. Hounds were sacred to the faeries of Ireland and Scotland and thus were held in very high regard in both Celtic lands. Hounds eram sagrados para as fadas da Irlanda e da Escócia e, portanto, realizaram-se em conta muito alta em ambas as terras celtas. These faithful protectors were the Celtic animal symbols of loyalty, devotion, and unwavering faith and love . Estes protetores fiéis eram os símbolos animais Celtas de lealdade, devoção e inabalável fé e amor. The wolf symbolized even more...representing learning and deep intuition. O lobo simboliza ainda mais ..., em representação da aprendizagem e da intuição profunda. 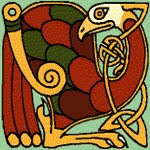 Birds are one of the most complex animal symbols of the Celts. With the wide variety of birds can be seen, the meaning is often shrouded in the kind of bird. To understand the birds and animal Celtic symbol, one must understand the characteristics of each bird in particular. Crows: The raven was associated with death. 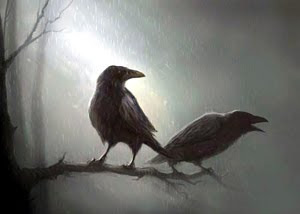 Ravens: Raven also called forth the idea of death, but was also used by the Druids in augury, and flew over Celtic battlefields as a God incarnate. Eagles: The Eagle fearful, threatening was associated with both nobility and death. Peacocks: The peacock, symbol of purity. Cranes: Thanks to the many myths of heroic figures or deities being transformed into cranes, these birds have come to represent an apparent but not real change and are often called signals as punishment for cheating. Herons: A heron, because mated for life, was often used in wedding bands Celtic. Ouzels: The Ouzel was known to be a small shield, but steady himself and his flock. 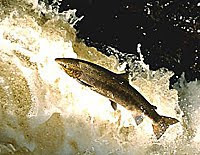 Salmon: The salmon was the symbol of all knowledge. These creatures that swam in rivers and oceans were also linked to the sacred ancient mysteries and deep emotion. As aves são um dos grupos mais complexos dos símbolos animais Celtas. Com a grande variedade de aves que podem ser vistos, o significado é muitas vezes envolto no tipo de ave.
Para compreender as aves como animal símbolo celta, é preciso entender as características de cada ave em particular. Crows: O corvo era associado à morte. Ravens: O corvo também chamado adiante a idéia da morte, mas também foi usado pelos druidas em augúrio, e voou sobre campos de batalha celta como um Deus encarnado. Eagles: A águia temível, ameaçador foi associada com ambos nobreza e da morte. Peacocks: O pavão, símbolo da pureza. Cranes: Graças a vários mitos de figuras heróicas ou divindades sendo transformado em guindastes, estas aves passaram a representar uma aparente, mas não uma mudança real e muitas vezes são chamados de sinais de como punição por engano. Garças: A garça, porque acasalado para a vida, era frequentemente usado em bandas de casamento Celtas. Ouzels: O Ouzel era conhecido por ser um protetor pequeno, mas firme de si mesmo e seu rebanho. Salmão: O salmão foi o símbolo de todo o conhecimento.